I have always been a collector of things dating back to age 11 or 12, starting with rocks and minerals which are abundant and easily found here in North Jersey. Eventually with the advent of the computer and the founding of eBay I started collecting everything and anything from Paterson, New Jersey in the late 1990s. I chose Paterson because of its amazing history and because it borders Totowa, the town my family has always called home. I had seen many bottles for sale over the years while searching eBay but had never really thought to collect them. I seemed more drawn to books, photos and other items from the area, and then one day an Archdeacon Mineral Water sold for over $1,000. That piqued my interest and led me to do some on-line research. That is when I found antique-bottles.net, and after a little research there I was hooked. I have a friend who I consider my mentor, Tom Leavy, a long-time collector and contributor to HutchBook.com. Tom has spent many years digging with his friend and fellow bottle legend, Jim Jack. They were the first two bottle people to take me under their wing. One day they dropped off two cases of bottles they had dug for me to go through. Most had prices that were very cheap, and the others had no prices and were free to me. Since that time we have become close friends and they have added many bottles to my collection. Luckily I have been able to return the favor on occasion. It's not easy finding bottles those two haven't come by, but when I do it's a thrill. After starting with rocks and minerals, at 13 I began collecting beer cans, eventually joining the Beer Can Collectors of America. From 21-35 I didn't really spend much time or effort collecting anything, and then a family friend got me interested in Royal Doulton character jugs. I collected them extensively for a number of years and soon amassed the largest collection of them east of the Mississippi. They were displayed throughout my house. When the friend who started me collecting them passed away, I decided I no longer wanted them around, so I put the first one he had given me into his casket and sold the entire collection to a Royal Doulton collector in the United Kingdom. My grandfather on my father’s side collected things over the years but I'm the only one in the family now who collects things. WHAT IS YOUR BOTTLE COLLECTING SPECIALTY? WHAT TYPES OF BOTTLES DO YOU COLLECT BESIDES HUTCHINSONS? I collect bottles from Paterson, New Jersey and the few surrounding towns – any style bottle as long as it's from Paterson. My favorites are the David Boyle and the George Spreitzer Hutchinsons. 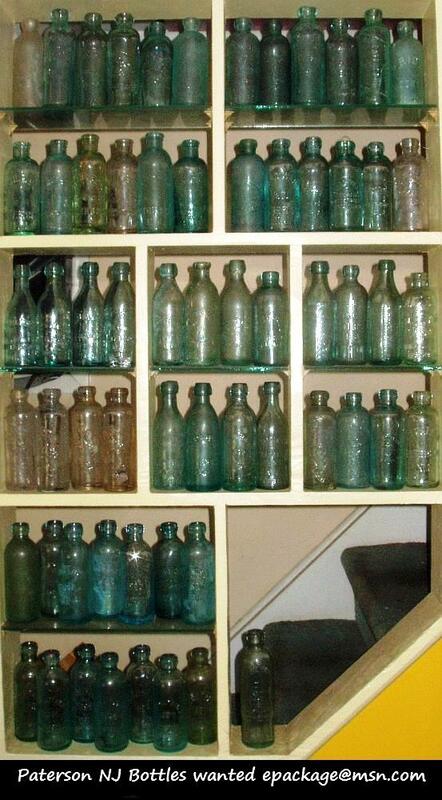 They both dated their bottles every year, so it makes for a very extensive collection. HOW DO YOU ACQUIRE BOTTLES FOR YOUR COLLECTION? I used to dig bottles and stuff from dumps as a kid but never really thought to collect bottles. Like many kids, we used bottles for target practice, and it makes me cringe to think what we may have destroyed back then. Now I find them at flea markets, bottle shows, eBay, antiques stores, and through networking on-line on sites like antique-bottles.net and njbottles.com. WHAT ARE THE BEST HUTCHINSON BOTTLES YOU HAVE FOUND? There are some great regular and quart Hutchinsons from David Boyle and George Spreitzer that were unlisted on HutchBook.com until just recently that I was happy to send you info on. My personal favorites are the Gould and Pfannebecker Hutchinsons because of the vertical diamond embossing. Gould took over the building after Pfannebecker in 1897 and reworked his molds for his own use as you can see by the pictures. I am hooked on trying to collect all the known dated examples from both David Boyle (1897-1912) and George Spreitzer (1882-1899). This process keeps me awake at night! I would love to have one of every example from Paterson you have documented on HutchBook.com. I have two main displays set up right now – one on a stairway leading to the second floor of my home, and the other is in my living room. I picked up two fireplace mantels at a local garage sale for $10 figuring I could use them in my office to display bottles. They are heavy and deep and I knew they could handle a lot of weight and I wouldn't have to worry about the bottles “walking” due to normal vibration and falling off. I then saw a nice display using similar shelves on Antique-Bottles.net and I started to seek them out on Craigslist and anyplace I could find them cheap locally. I ended up using two six foot long shelves top and bottom, with two five footers side-by-side in between. I am very happy with the results. The two five footers have quart Hutchinsons with the matching pint Hutchinson placed beside it. I'm always looking to add “go-withs,” be it bottle caps, signs, photos, letters and anything else pertaining to the hobby. There are a few people who think I put too much time and effort into it, but that's just who I am and I don't see that changing. I tend to post too much on the bottle forums, and some folks don't like that, but it has led to many great contacts over the years. HOW DO YOU RESEARCH YOUR BOTTLES? I spend a lot of time talking Paterson bottles with Tom Leavy. I like to get everything written down on paper and then downloaded into a file on my computer. I am lucky to have a friend like Tom who has spent countless hours going through all of the Paterson City Directories detailing each and every brewer, bottler, liquor dealer, saloon, and pharmacy dating back to the 1850s, and cataloguing the names, dates, and addresses on index cards. I then transfer that data to my computer so it can be updated and printed out anytime we need it. I'm also a bit of a crazy person when it comes to on-line searches on Google. I spend many hours typing in different variations of the names of Paterson bottlers and brewers looking for any history I can find. 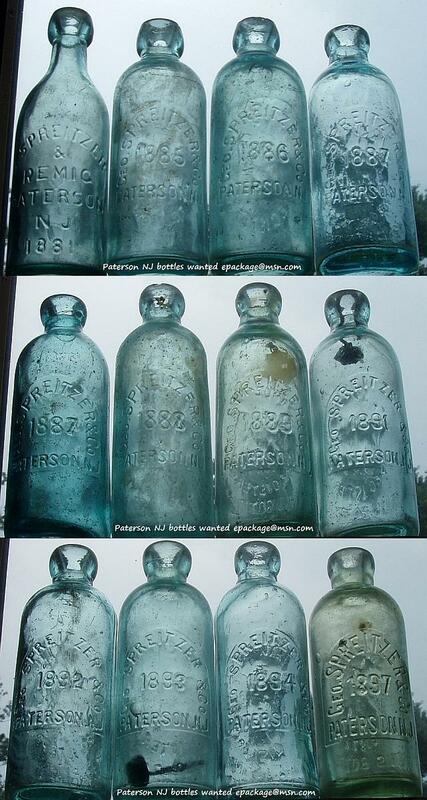 I also spend considerable time searching completed eBay auctions and contacting buyers of Paterson bottles to see if they are willing to sell or trade them. If not, I try to have them send photos of the bottles to me if I don't already have an image of that particular bottle. I also maintain a database of every Paterson bottle sold on eBay since 2010 detailing the bottle, it's condition, price including shipping, who bought it (eBay username), and when. I also keep track of all the regular eBayers who bid on Paterson bottles so I can tell who is bidding and what they might be willing to pay for a bottle. 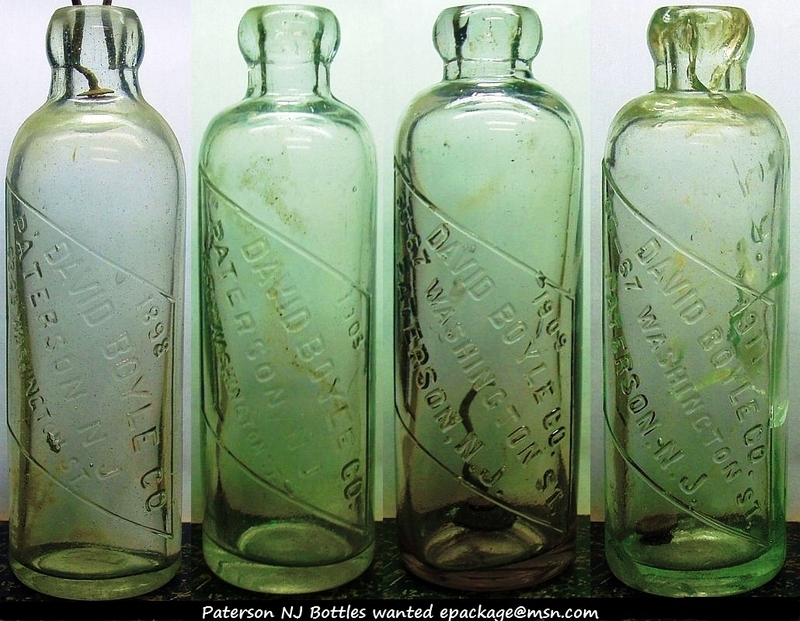 Thanks to Charlie Jonsen, the fine gentleman who started njbottles.com, I have been able to find a lot of family history information for a decent amount of Paterson bottlers. Doing so has helped me acquire many bottles and also to pass along many bottles to the descendants of some Paterson brewers and bottlers. I highly recommend njbottles.com and hope to see other collectors use it as a model for making a database in their states. I use njbottles.com and Antique-Bottles.net everyday. I also use sodasandbeers.com, ricksbottleroom.com, sha.org, glassbottlemarks.org, fohbc.org, bottlemysteries.com, and pre-pro.com. I am also a member of the Facebook sites for Bottle Collecting, Bottle Selling and Stoneware and Pottery. HOW HAS YOUR COLLECTING BEEN INFLUENCED BY OTHER COLLECTORS? Tom Leavy has been the biggest influence on me and my collection. He never lets you leave his house without a bottle, and the research he has spent so many hours gathering has been invaluable to me. I learn so much regarding the bottlers and brewers that the bottles themselves seem to take a back seat to the actual history, and for someone like me that's fine. I love discovering how one bottler took over for another, or how a certain building was used in the 1870-80s by one company, then in the 1880-90s by another, and right on down the line. I can never repay Tom for everything he has helped me with, and can only hope to use that information properly and to record it for those who want to collect or research Paterson bottles in the future. I have also been lucky enough to make numerous friendships on many of the bottle sites and that has led to many bottles being traded or bought that I may have never come across otherwise. I am friends with Connor Rush, a young collector of Essex County New Jersey bottles who has been featured on HutchBook.com and in Antique Bottle & Glass Collector magazine. Connor has a great perspective from the younger point of view that is refreshing. The contacts made on the forums can really open your eyes to how others collect, research, and display their collections. It feels great to be able to trade bottles with collectors in Hawaii, California, Missouri, and even overseas. DO YOU COLLECT SOMETHING(S) OTHER THAN BOTTLES? I still collect anything from Paterson, but bottles have become my main focus. My search for other things from Paterson has slowed a bit compared to how it was from 1999-2009. I can be contacted via EMail at epackage@msn.com. I am happy to help with anything bottle-related, even if it doesn't pertain to Paterson, New Jersey.